Not to be confused with Grahovo, Nikšić. Bosansko Grahovo (Serbian Cyrillic: Босанско Грахово) is a town and municipality located in Canton 10 of the Federation of Bosnia and Herzegovina, an entity of Bosnia and Herzegovina. It is situated in western Bosnia and Herzegovina near the border with Croatia. Gavrilo Princip, the main perpetrator of the assassination in Sarajevo of 1914, was born in the village of Obljaj located just east of Bosansko Grahovo. From 1929 to 1941, Bosansko Grahovo was part of the Vrbas Banovina of the Kingdom of Yugoslavia. 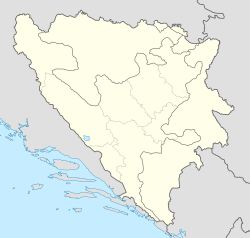 During the Bosnian War the city was held by Bosnian Serb forces. In summer 1995, Croatian Army captured the city which led to a mass-evacuation of local Bosnian Serbs. After the war, the Serb civilians returned, and today, they again form majority of population in the municipality. Wikimedia Commons has media related to Bosansko Grahovo. This page was last edited on 1 January 2019, at 08:56 (UTC).